Hips, schmips. I need to work. Border collies are pretty lucky in the genetics department. Compared to many canine breeds, relatively few hereditary ailments afflict them. One exception is hip dysplasia. For any dog, hip dysplasia is a difficult condition. But for the workaholic, constantly active border collie, it means he can't do his job. Hip dysplasia, a problem in many breeds, occurs when the thighbone's head doesn't fit into the hip socket. This deformity causes the bone to deteriorate, eventually leading to arthritis at an early age. This degenerative joint disease breaks down not only the bone but also the cartilage, the protective cushioning of the joint. Your dog starts limping, with the lameness growing progressively worse. He's also in considerable pain. Your vet diagnoses hip dysplasia via X-rays. It's not something that can be definitively diagnosed just by symptoms and physical examination. It's possible that as many as 25 percent of border collies have some form of hip dysplasia, according to the American Border Collie Association. A study by the Orthopedic Foundation for Animals found evidence of hip dysplasia in 10.8 percent of border collies evaluated between 1974 and 2011. However, the selection for screening of dogs likely to have favorable results skews the results considerably, says the American Border Collie Association. The association estimates that the number of affected dogs is probably twice as high. Treatment depends on the severity of the condition. Dogs with only mild symptoms of hip dysplasia might receive pain medication prescribed by a veterinarian. Serious cases might require a total hip replacement, a costly surgery requiring a fair amount of recuperation. However, if you can provide your dog this surgery, his quality of life should improve considerably. He can even get back to work, whether it's herding sheep or herding house cats. The cats might not be too happy about his new lease on life. Before purchasing a border collie puppy from a breeder, make sure the breeder guarantees the animal's hips through Orthopedic Foundation of America certification. Responsible breeders evaluate the hips of the potential mother or father through X-rays before mating them. They should also have information on the hip conditions of the breeding pair's ancestors before making the decision to produce puppies from this pair. Once you bring your puppy home, take steps to ensure his hips stay healthy. During his first couple of years, avoid too much "rough play, excessive jumping, quick stops and turns, exercise on hard surfaces, and romping with bigger dogs," the American Border Collie Association advises. Such activities could cause additional wear and tear on his still-maturing joints. And make sure your young dog doesn't become overweight. 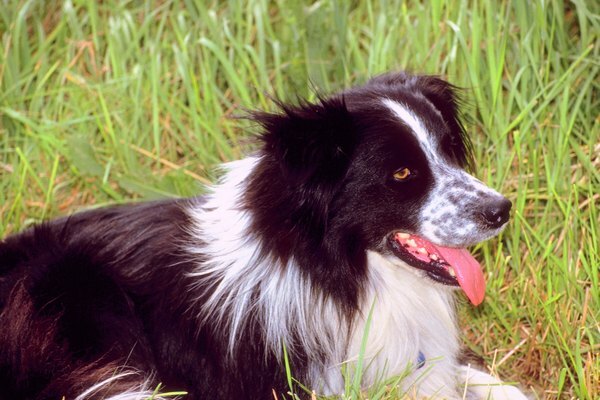 What Is a Smooth-Coated Border Collie?